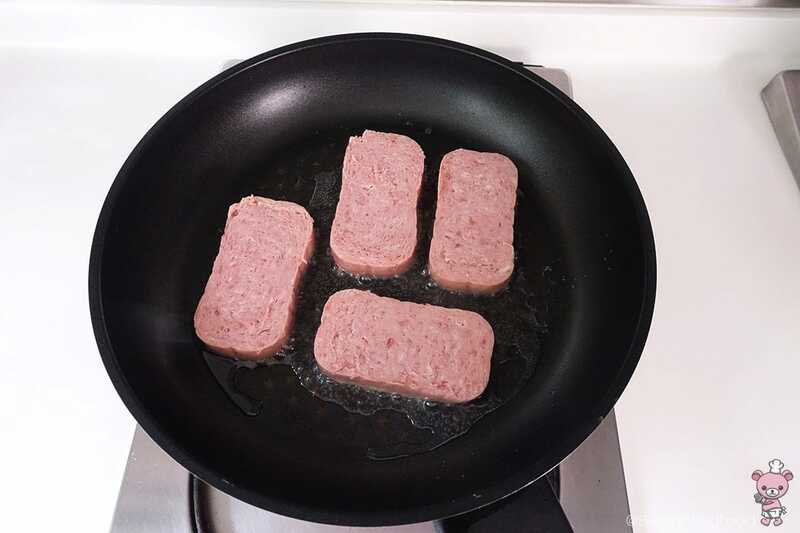 In the U.S., there is Spam (the meat, not the mail). 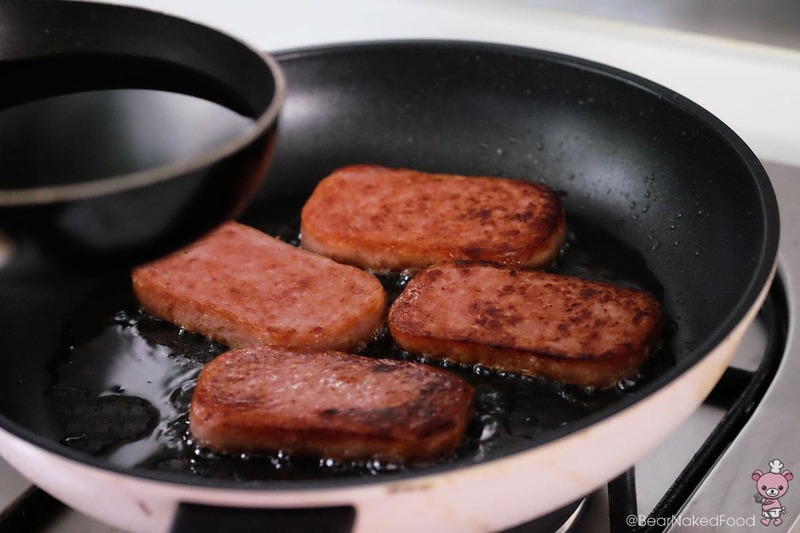 In Southeast Asia, they are known as luncheon meat. Wherever they come from, the reputation of this cured meat has always been primarily perceived as “mysterious” or “dubious”. How could something that taste so good be so bad? 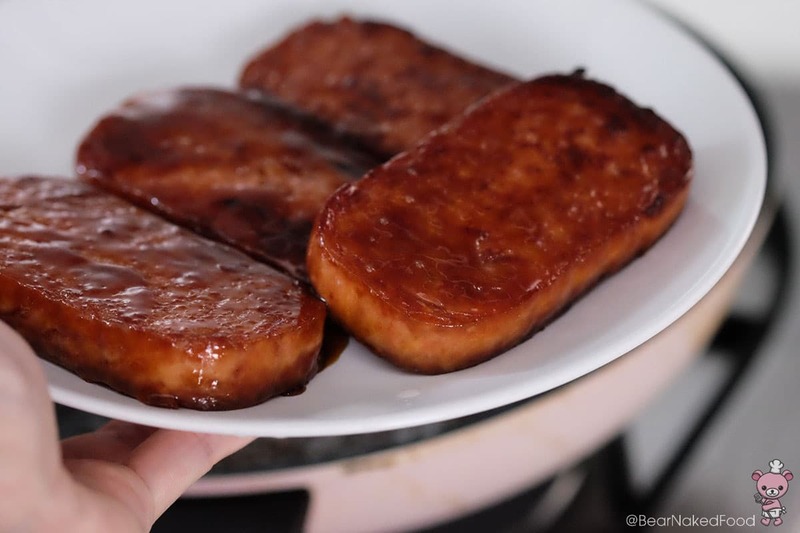 I fondly remember it was such a delicacy for us kids when mom fried up some luncheon meat slices for dinner. 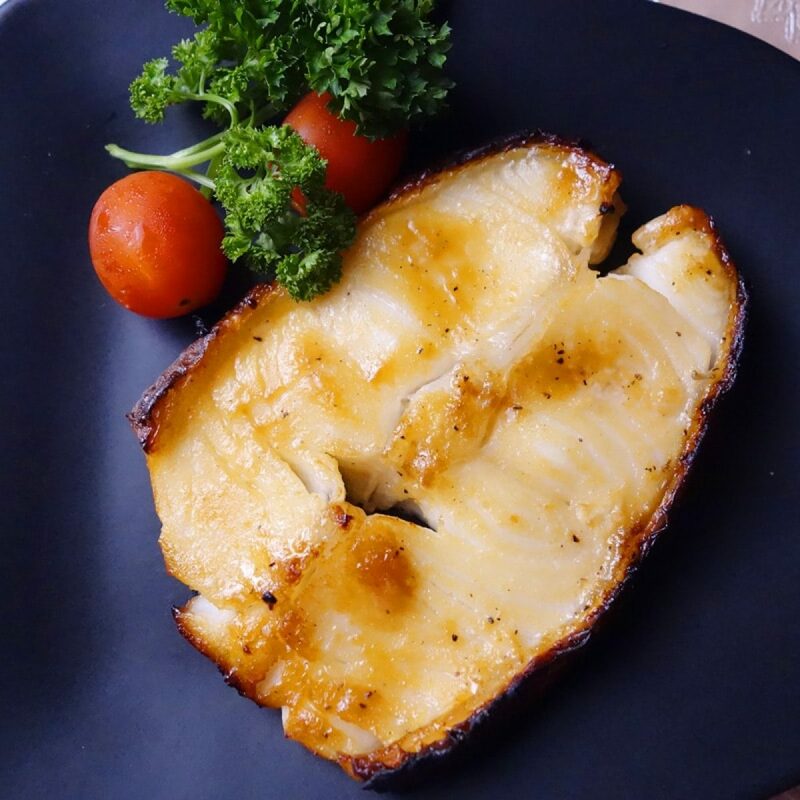 We would savor the crispy, salty meat carefully and save the best for the last. 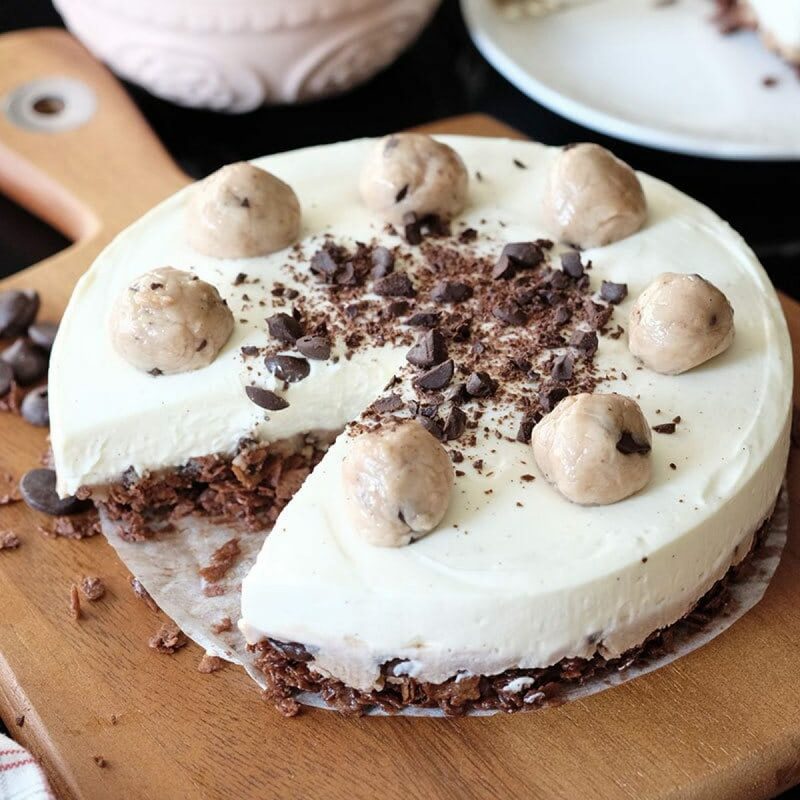 I believe moderation is the key, so there is no reason not to give into our cravings, once in a while. But I seriously cannot remember when the last time I had Spam was. It was that long ago. 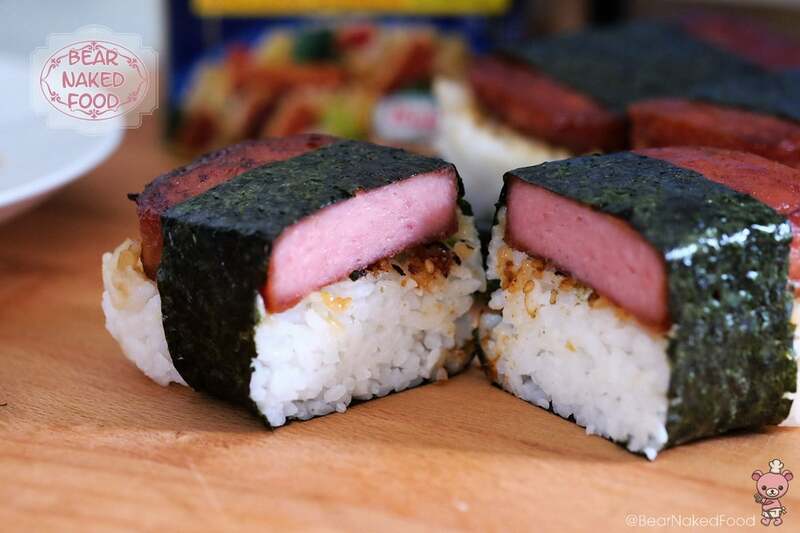 Making this Teriyaki Spam Musubi has always been on my mind, thanks to food Network “Best Thing I ever Ate” segment. This ginormous-looking onigiri originated from Hawaii and is well-loved by the locals and tourists. I read they are so popular you could find them in every convenience store on the island. Well since I don’t think I’ll be making my way to Hawaii anytime soon, it is probably best I make some myself. Right now. 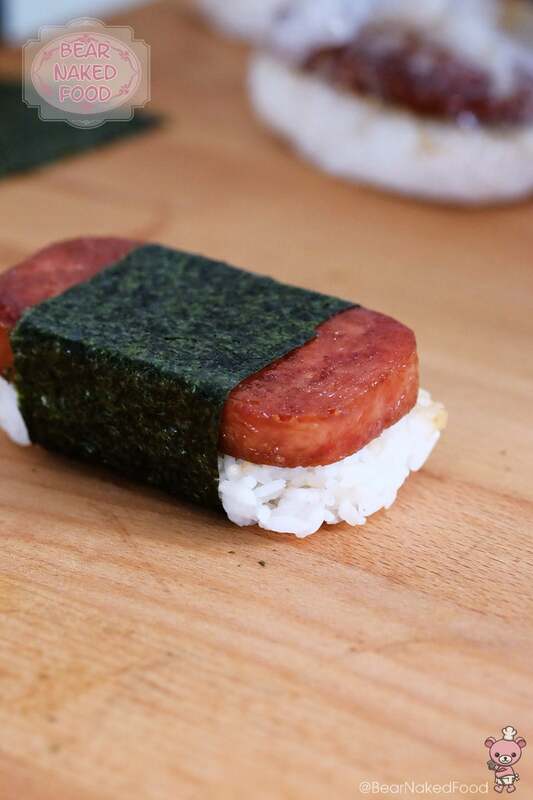 The ingredients are pretty easily available in all supermarkets, except for the musubi maker. I was told I could find it at Daiso but going there has always been a trap for me. What started off as an innocent I’m-just-going-to-buy-one item trip, always end up with a trolley full of stuff. Well, that’s another story. 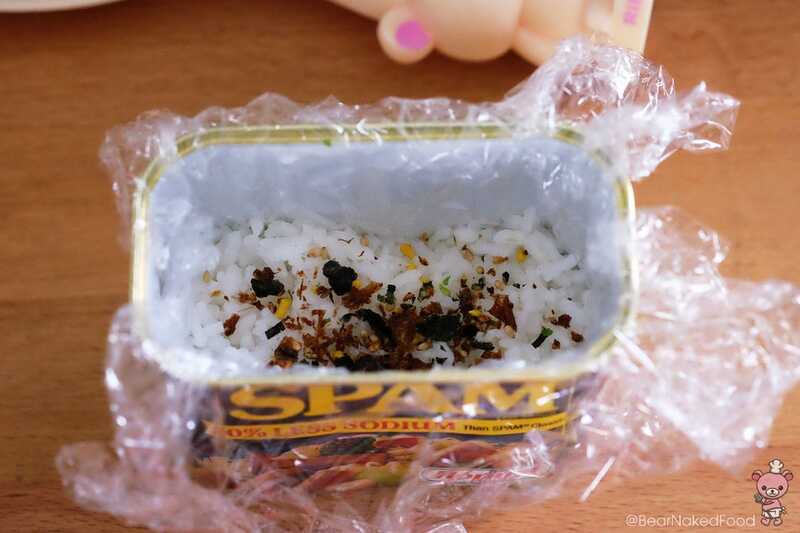 Thankfully, the tin that holds the spam could be doubled up as a mould as well. Whew! 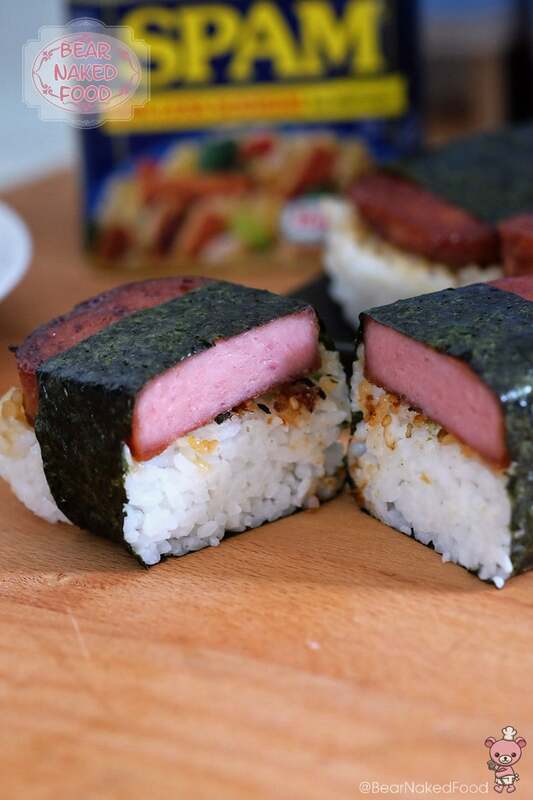 Oh, so what’s the verdict of this Teriyaki Spam Musubi? 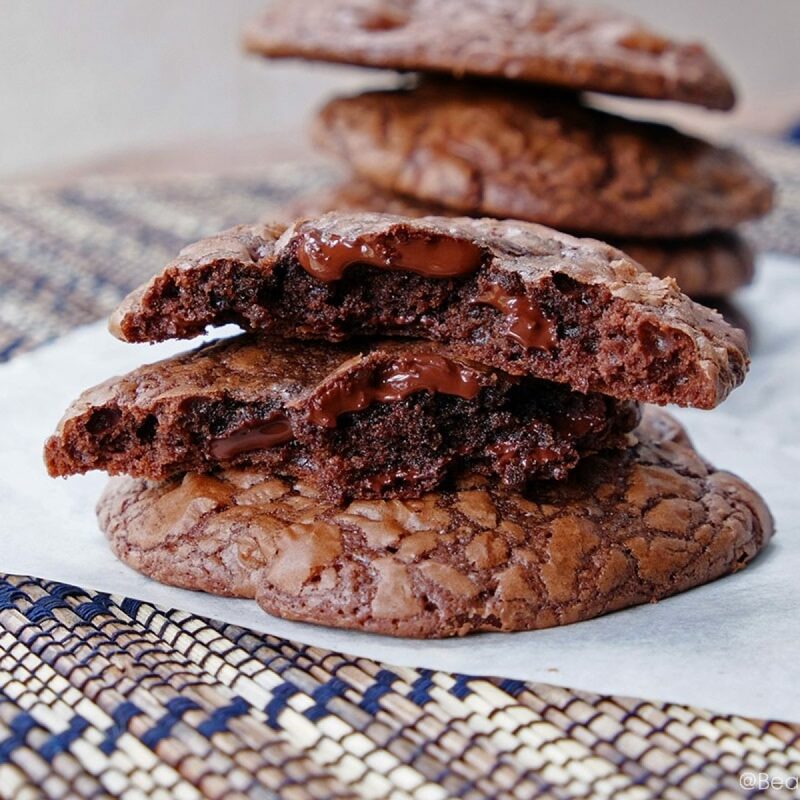 Let’s just say the tastiness level of this easy creation is not to be taken lightly. 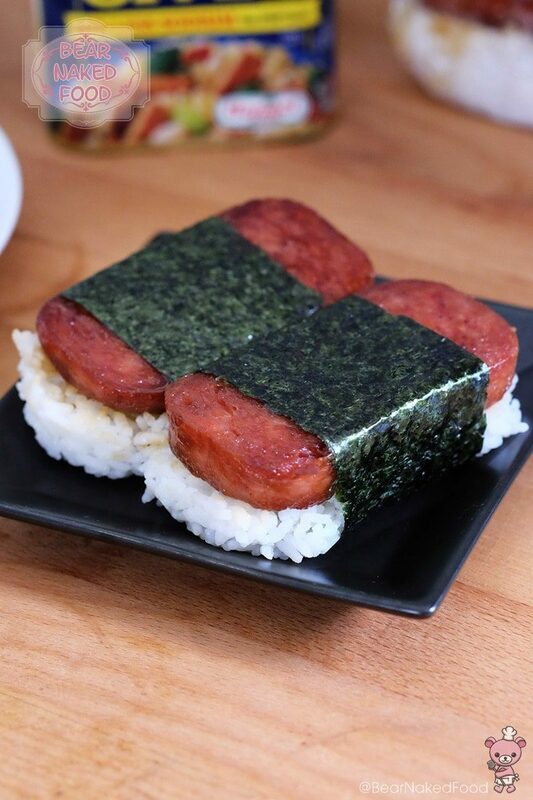 The ratio of the rice to spam proportion is entirely up to your own preference. This also applies to the fillings. 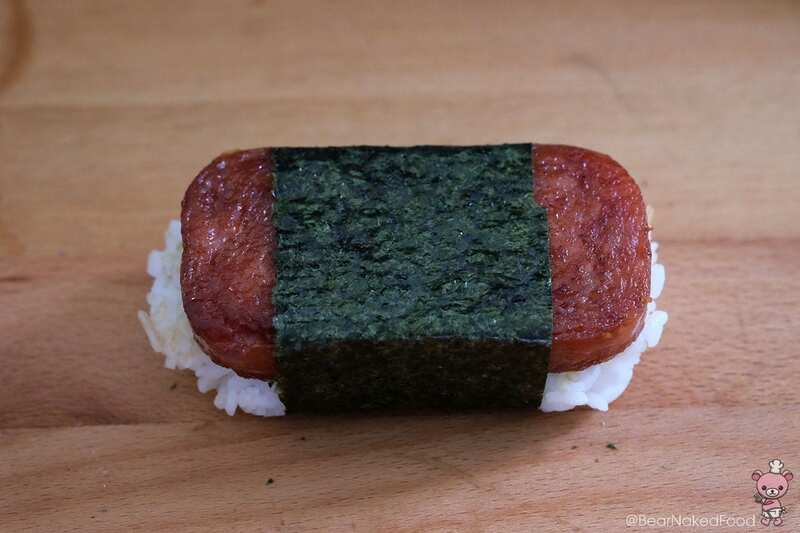 I’ve included some optional fillings you could add in your musubi in the ingredient list below. Teriyaki Sauce Ingredients. 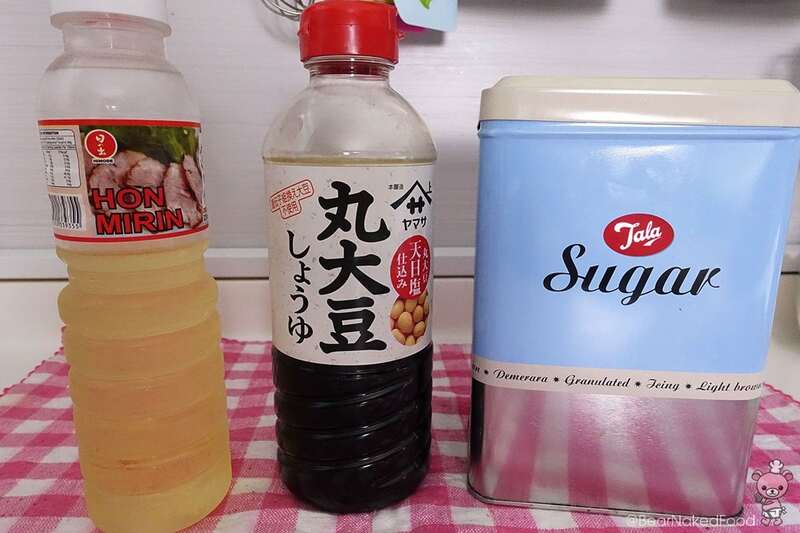 From left to right: mirin, soy sauce and sugar. 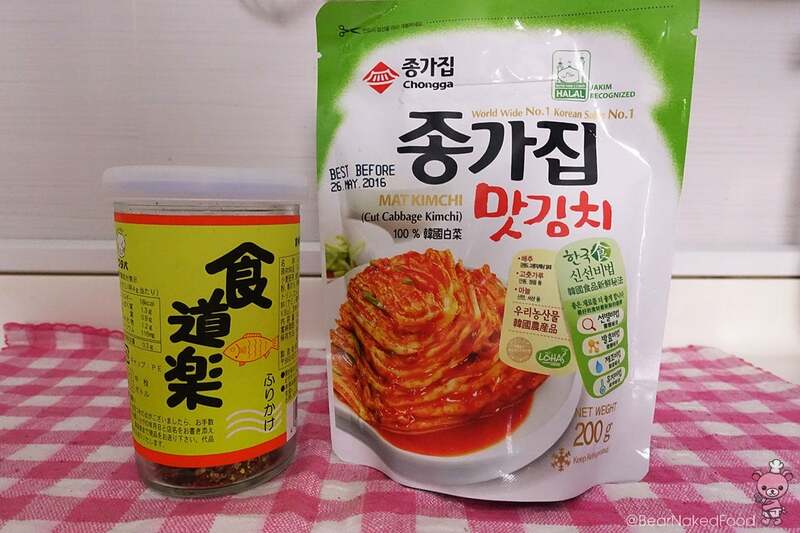 Optional fillings: furikake and kimchi. 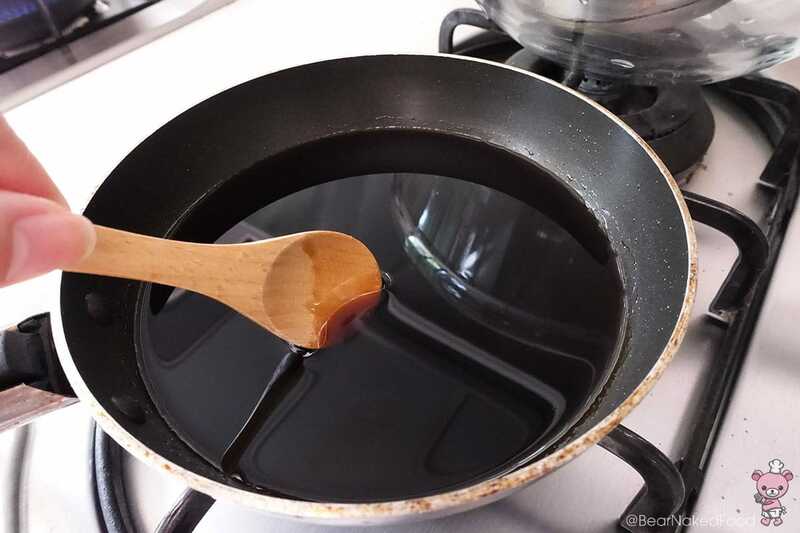 In a small saucepan, gently heat all the ingredients for the teriyaki sauce until the sugar has melted. Set aside. 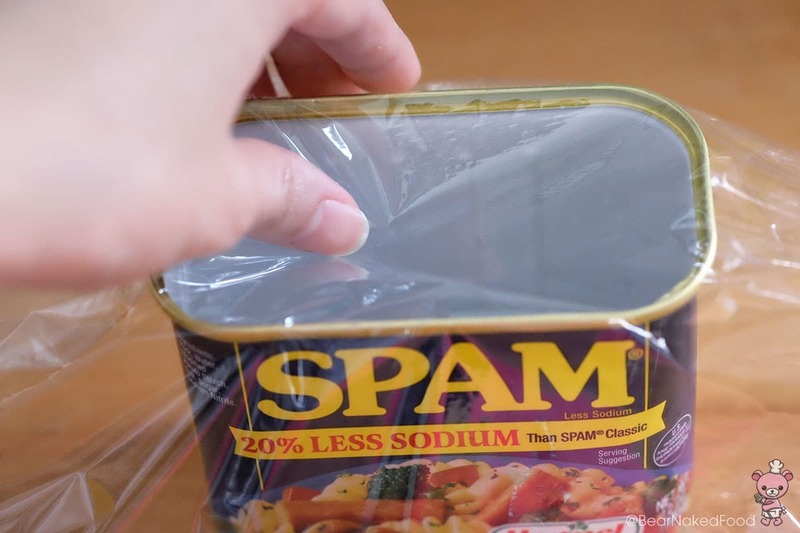 Remove spam from the tin and cut into 5 – 6 slices (approx. 1/4 inch thickness). Wash the tin and wipe dry. It will be used as the mould to form the musubi. 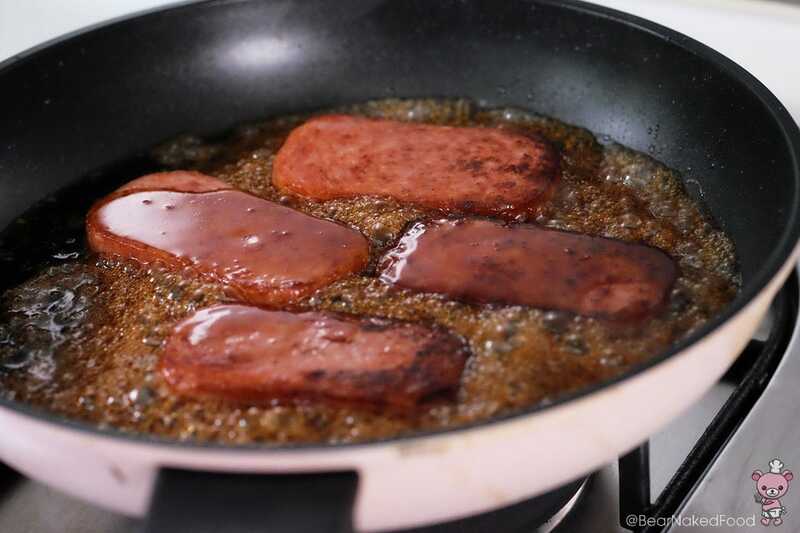 Add 2 tbsp oil into a large skillet or pan and cook the spam slices until nicely brown on both sides. 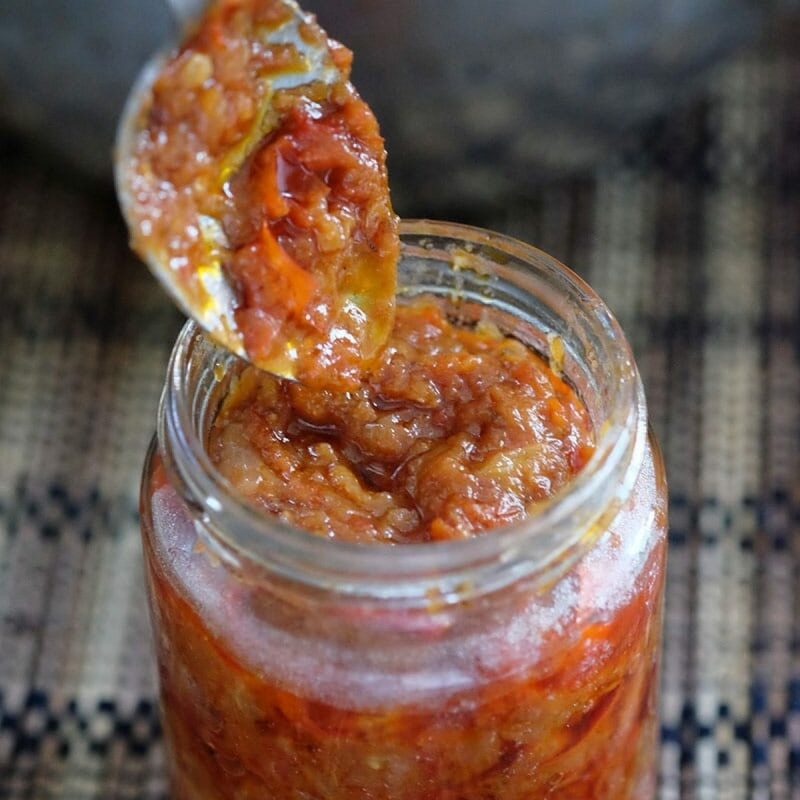 Pour in the sauce and cook under medium high heat until the sauce bubbles and coats the meat. Remove from pan and set aside. 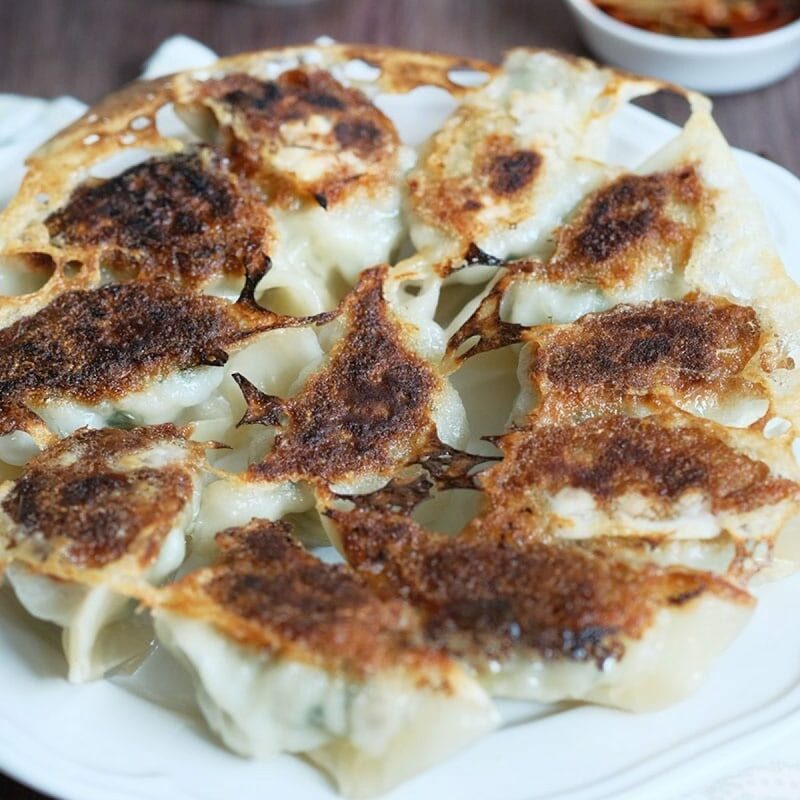 Pour the remaining sauce into a small bowl and reserve as a dipping sauce. 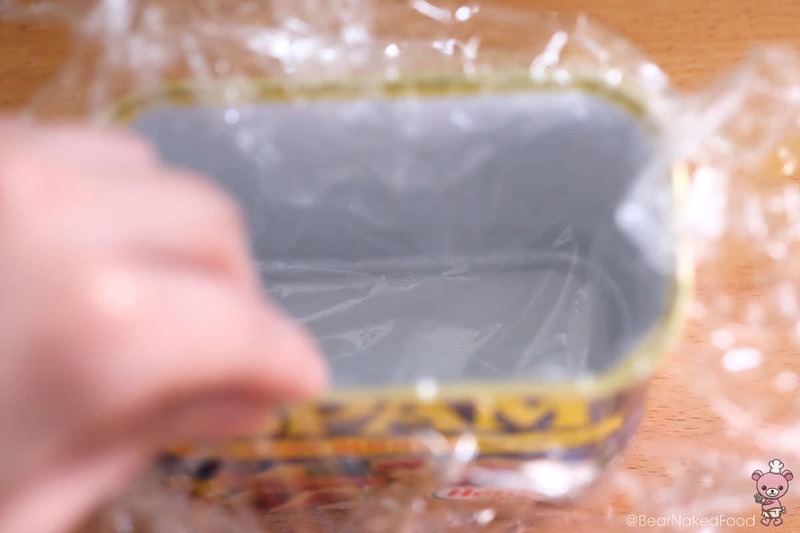 Line the inside of the tin with cling wrap. You will need a large sheet so the excess drapes out of the tin. Push the cling wrap all the way down. Scoop 4 – 5 tbsp rice into the tin and gently pat it evenly. 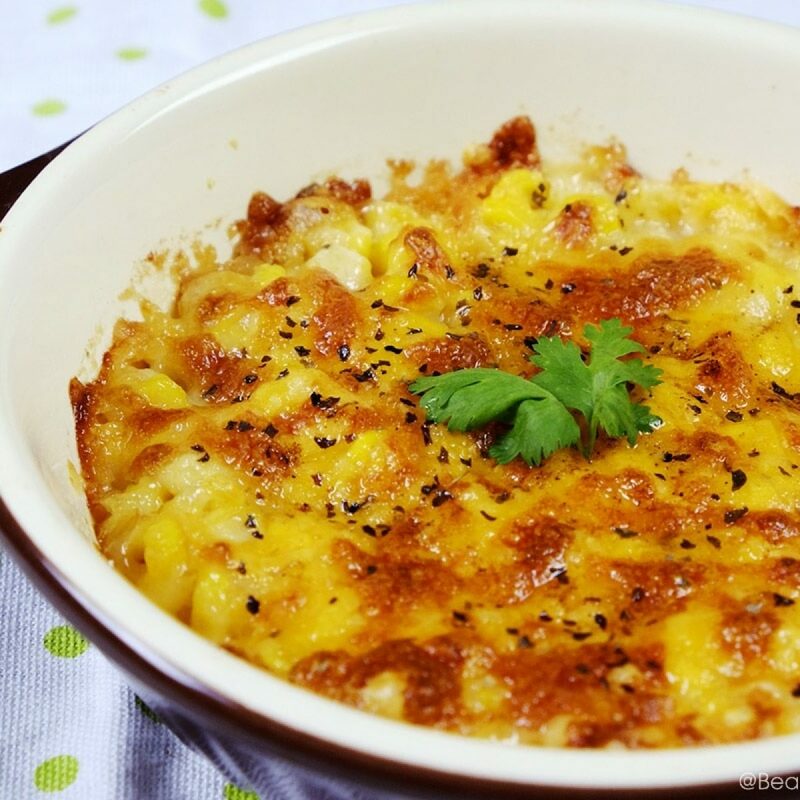 At this point, if you are using any optional ingredients, lay it on top of the rice. 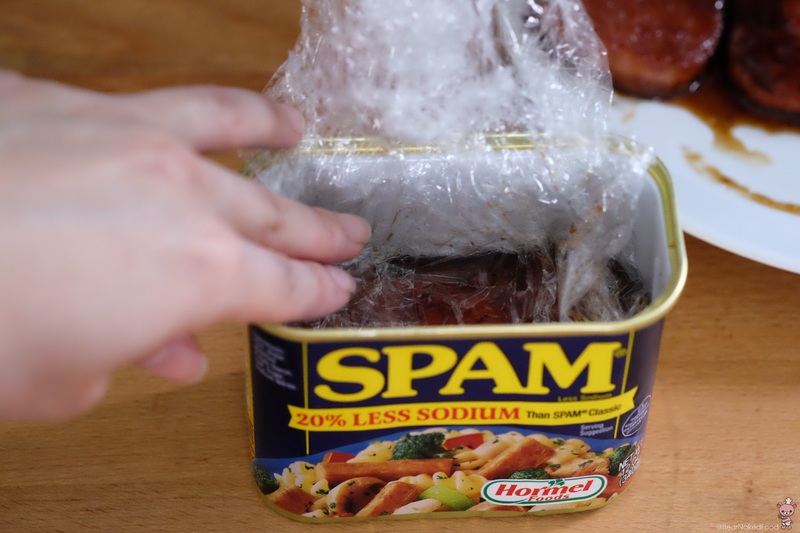 Take a slice of the spam and fit it into the tin. It should fit in snugly. Gather the excess cling wrap and press it down firmly to form its shape. 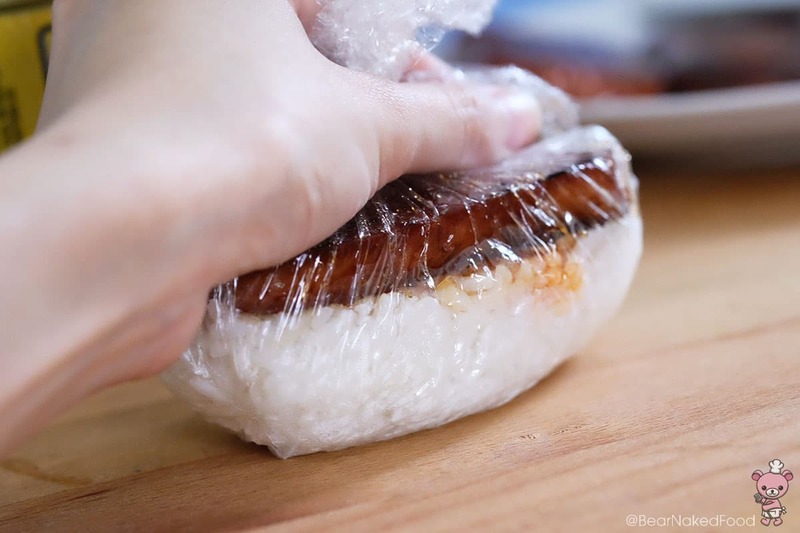 Pull out the cling wrap together with the spam rice block. 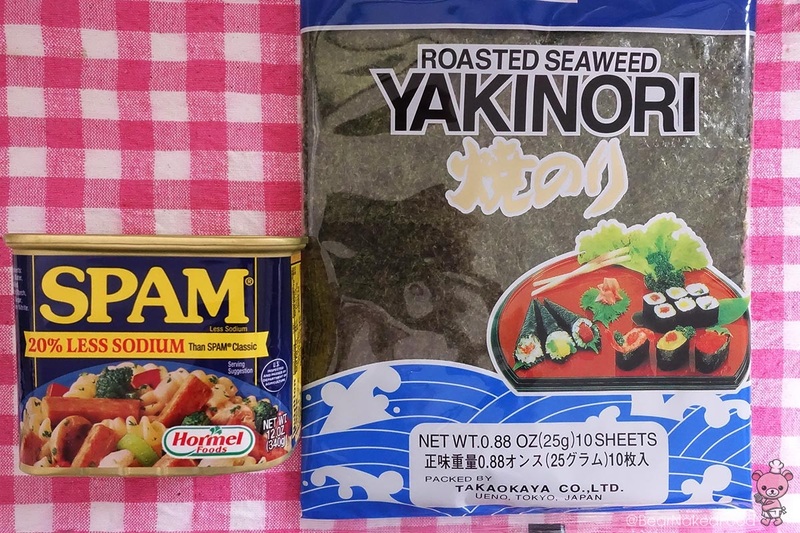 Transfer the spam rice block onto a strip of nori (rice side up) and fold it tightly. Seal the end with a dab of water so it’ll stick. 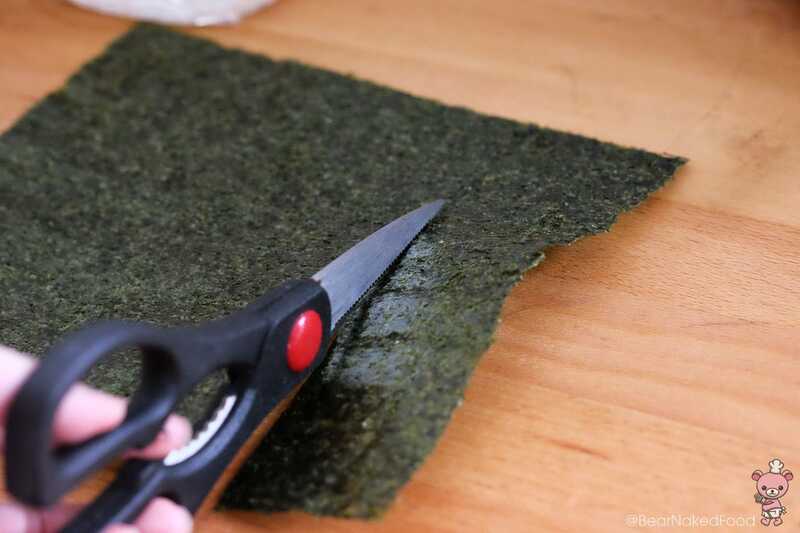 Place onto the nori sheet. Wrap it tightly and seal the edge with a little water. 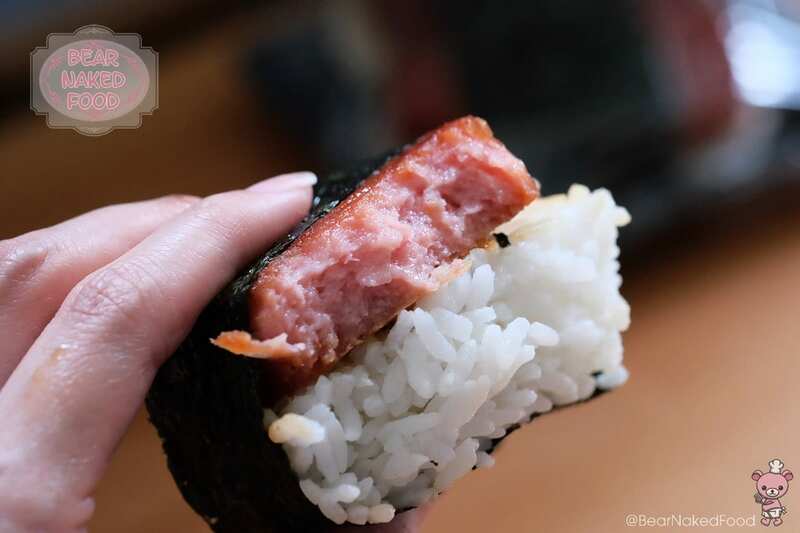 Enjoy your spam musubi warm or at room temperature and with reserved sauce. 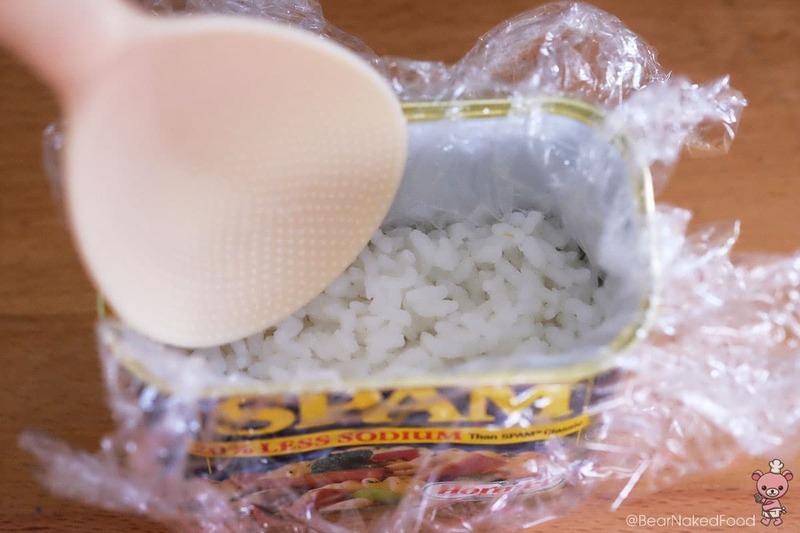 *Note: the size of the spam and amount of rice used is subjected to your personal preference. 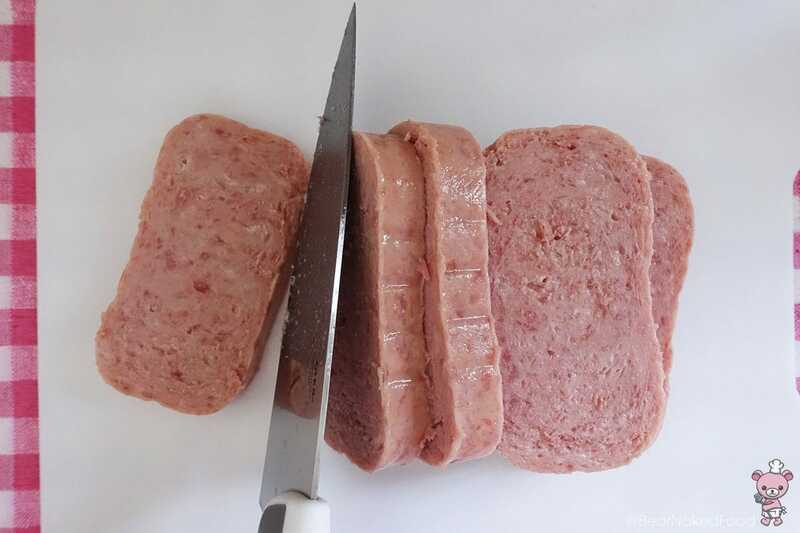 Remove spam from the tin and cut into 5 – 6 slices (approx. ¼ inch thickness). Wash the tin and wipe dry. 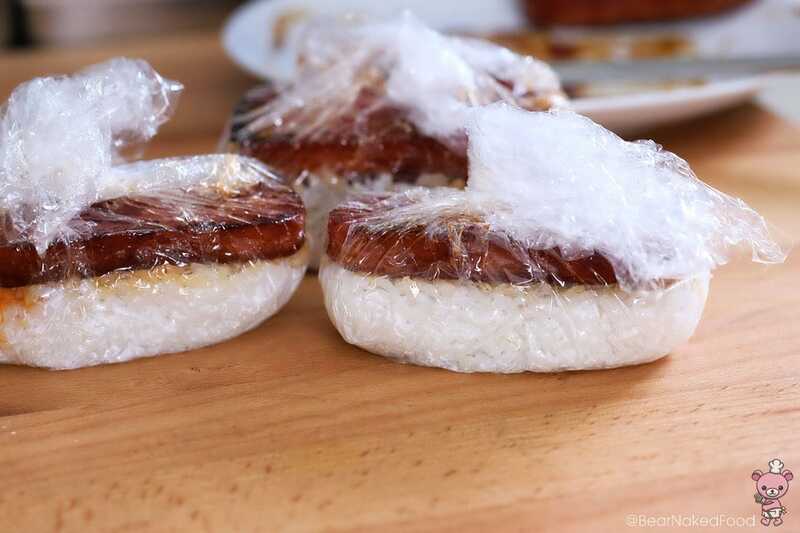 It will be used as the mould to form the musubi. 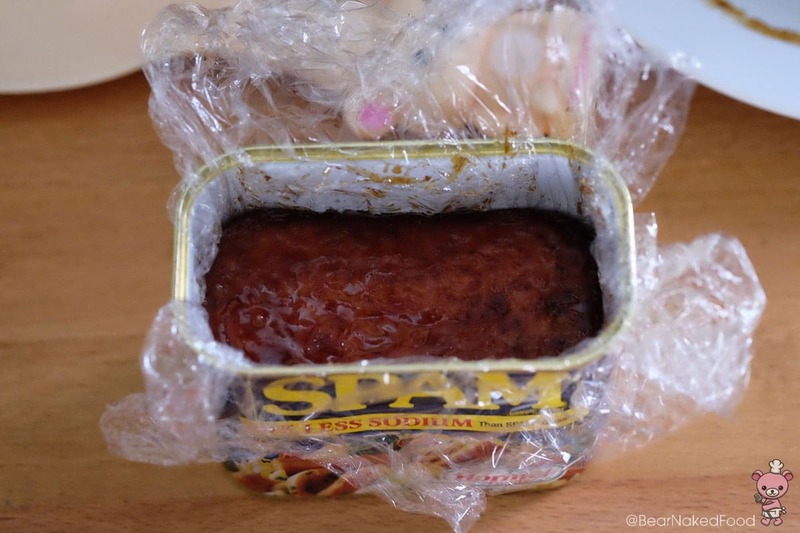 Take a slice of the spam and fit it into the tin. Gather the excess cling wrap and press it down firmly to form its shape. 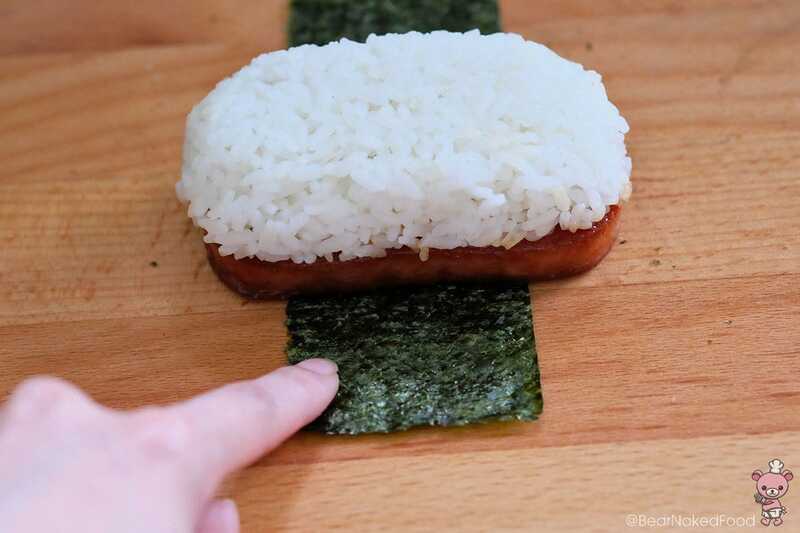 Transfer the spam rice block onto a strip of nori (rice side up) and fold it tightly. Seal the end with a dab of water so it’ll stick. Repeat with the rest.